After qualifying as a Soft Tissue Therapist in 2004 Kate has been working with a dynamic range of clients. These range from those that do sport as a hobby to elite athletes in sports such as Triathlon, Swimming, Diving, Power lifting, Football, Athletics and Netball. Kate’s clients are not all restricted to sports and she has a number of clients that utilise Soft Tissue Therapy to improve posture and pain caused by everyday life. As part of her development Kate has been lucky enough to have been mentored by a number of established sports medical professionals, including clinic director Alison Rose and Association of Soft Tissue Therapist board member Paula Clayton. The knowledge and experience Kate has imparted from this has enabled her to learn a number of techniques that has further developed her skill set. 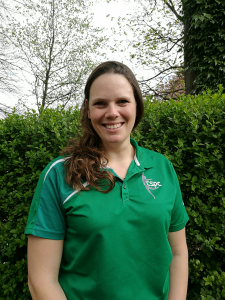 Kate spends a number of days throughout the year shadowing other sports medical practitioners, as well as mentoring newly qualified soft tissue therapists in order to maintain a fresh approach to her work. The majority of Kate’s Event work has come in Track and Field Athletics, where she has travelled with Great Britain Teams, covered British athletics domestic and televised events and also Great Run events. Kate was part of the British Athletics Paralympic team at the European IPC Championships in the summer of 2014. Kate specialises in using a wide range of Soft Tissue techniques for whole body alignment, ensuring that the body’s soft tissue is in optimal condition to ensure you are able to achieve the goals you have set yourself. Outside of clinic Kate enjoys keeping fit, being outside especially walking with her dog.